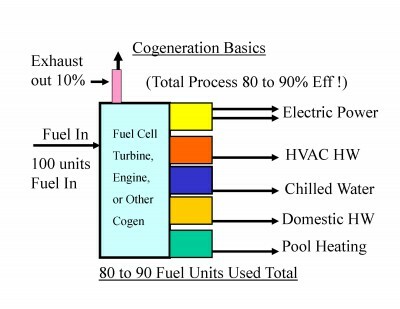 Cogeneration or Combined Heat and Power (CHP) is the simultaneous generation of two or more forms of energy from a single fuel source. By recycling valuable heat from the combustion process, CHP results in far greater efficiencies than centralized power generation. The recovered thermal energy may be used for industrial processes, space heating, refrigeration or space cooling through an absorption chiller. CHP is considered the most viable and economical use of distributed generation (DG) when implemented at or near the point of use.